Lighten up! Don't take everyday life too seriously, it's meant to be enjoyed! In this case, Hummingbird symbolism is reminding you that it is time for you to pursue your dreams more aggressively. By doing this, you will make them a reality. In other words, joy is just around the corner. Therefore, like the colorful Jewel Beetle, you have to believe that it is possible to manifest your dreams now. Stop waiting and go for it! Alternatively, Hummingbird meaning is letting you know that you can go anywhere you need to go. The only obstacle in your way is yourself. Furthermore, opportunities are manifesting quickly for you right now. Thus like the Heron, Hummingbird symbolism prompts you to seize them as quickly as possible before they are gone. People with the Hummingbird totem are messengers of hope and jubilation. Thus they aggressively seek out those that need inspiration and renewal. They have a knack for bringing out the best in them. Folks with this power animal are also loyal, playful and persistent. Like the lion totem, they are also fiercely independent hard workers who love to come up with original designs in all kinds of things. These people also take good care of themselves by making sure that they do not overextend themselves during their efforts to accomplish and construct things. People with this spirit animal have a natural talent for the forms and phrasings of movement. Thus they make excellent choreographers. Also, like the angelfish, they love to decorate and use color flamboyantly. When you have a Hummingbird dream, it suggests that seemingly small ideas and concepts often possess a lot of potential and power. In other words, what is a little idea can turn into a huge success. Alternatively, it can symbolize that your flighty thoughts and frivolous ideas have merit and thus are worthy of exploring. If the bird in your dream is plain and drab-colored it is a reminder that joy is something you create within yourself. It’s all in your attitude and perception. Occasionally, when you see a lot of these birds in many colors in your dream, the vision is reminding you that you create your reality. All you have to do is choose how it is perceived. I accidentally hit a hummingbird with my car today. It smacked into my windshield. I was crying and praying it died quickly. I couldn’t stop, it was a busy road. What does this mean? Last night I had a dream that I was in the kitchen and I saw something inside hitting against the window screen, I said what was that? My friend approached it as it was just kind of hanging on to the screen but still trying to escape. She then hold it and low to hold, it was the most beautiful, colorful hummingbird (I still can’t get over the colors) I have ever seen in my life. I can’t remember what happened after that but when I woke up the next morning, the first thing I saw through my bathroom window was a black and light grey hummingbird, enjoying itself to a feast of one of my potted flowers. So I came here today to see what was the meaning of this!!! My dog, who was so much more then a dog, passed away tragically in my arms from a blood clot that traveled to her lungs and essentially shut her whole body down. She was only 6 (super heathly otherwise) and I am severally depressed and hate the thought of her not being here a week later. It has rocked our world. She was my everything and I truly believe she was sent to me to help guide my way and protect me from darkness. She was the sassiest, kind hearted warrior I’ve ever had the pleasure of spending time with. Anyways the first morning after she passed I was obviously in an absolute state of shock and sadness. I was calling my best friend outside to tell her the tragic news and something hit the back of my head, HARD. I thought someone had thrown something at me. I turn to see and hear a loud hum and there’s a hummingbird just hovering and staring at me, only to quickly fly away after eye contact for a moment. I’ve never seen a humming bird here before and I wonder if it was her trying to lift me up, even after she had passed so soon before her time. This same exact thing happened to me after my sisters dog had passed away. I took care of her when she was little and then my sister moved to California. I was visiting her in California the week before her dogs surgery to remove a tumor. When I got back she had the surgery and she passed away during the procedure and the day after when I was going to my other sisters house I heard something behind me and when I turned around there was a humming bird eye level just hovering and staring directly at me and then it just flew away. I always thought it was my sisters dog letting me know she was okay. Me like I would get pregnant soon. Any ideas on this symbolism? I haven’t been able to find the Mohawk word for Hummingbird, which is odd, because she is definitely an animal the ancestors would have encountered. (If anyone out there knows, of knows of a source for finding the word, I would be thankful). Hummingbird speaks of joy and lightness and reminds us that many of the most beautiful things in life can only be encountered by remaining light and allowing room for joy and the appreciation for the breathtaking beauty that is existence. In my dream a hummingbird visited me twice, the second time I felt their wings brush against my neck. My dad has been very ill following surgery. Last night I dreamed of a white hummingbird. Any symbolism to my worry about my dad? I have always heard hummers are a sign of hope. that’s a beautiful symbol regarding your dad. Last year I actually found a baby hummer in my house which I took outside near a flowering vine, where it dove into one of the flowers and hungrily ate till it regained its strength and flew away. I was able to photograph it in my hand with my cell phone. That’s the second hummer in my house over the last 10 years but I kept a hummingbird nest for years until it finally fell apart. Also, surprisingly, they are quite the little warrior birds who migrate thousands of miles through the worst weather and fight off eagles who invade their territory. Quite the little spirit totems. I came to this site to find out if there was anybody else who had amazing spiritual experiences with hummingbirds and I was very surprised to see how many! I have had so many life altering experiences and everytime, I bird comes to me. Different birds for different reasons, but the good parts, the miracles and the life-saving experiences always brought this angelic messenger first. Nowadays, whenever I go out to the garden to pray, it comes – miraculously and flitters in front of me. Sometimes in circles and other times on a flower or tree in front of me. I am not sure what a totem bird is, but my spirit and the hummingbird’s are forever connected. I really am happy to see so many similar stories. I was googling Hummingbirds when I came across this site, I”m replying because I had this amazing dream this morning about a Hummingbird, before I begin in the past it seemed they were always around my husband on a constant basis. My dream begins with myself my eldest son and Jon Bon Jovi and his wife in my backyard, we walk across the street to a garage sale, my son sits down I continue to talk to the Bon Jovi’s when I look at my son he has a Hummingbird flying right beside his head the bird proceeds to go in his ear, as he enters the ear the bird changes into a Red Tail Hawk, I seen the fan of the tail feathers go in this little tiny ear hole and never came out, there was no freaking out, we all ended up in my backyard I look at my clothes line and there is this beautiful feather beige and a sienna colour pinned to the line. I have interpreted the dream, I guess my comment is not only are you going to see them in waking, if they are or will become part of your totem, dream state will clarify it. Might I suggest next summer go get a Hummingbird feeder, I’ve seen plenty of them this past summer and always brings a big smile to my face. I was starting to feel sad when watching my wife look through our bills and how it’s piling up and then at that moment I look out my front door window and saw the most beautiful green humming bird. It was the first time I seen one.And at that moment I realize that everything was going to be ok? Stay calm stay true. My sons girlfriend was telling us of an experience she had last night while visiting her dads house. She had actually posted a picture to her FB page with a picture of a hummingbird moth. Real thing look them up! But we were talking about how odd they looked and asking geez what spirit animal would she look up? Hummingbird or moth.. Everyone went in side and a little while later I went back out side. After about 1 minute this hummingbird flew up over my head hung out for a few seconds and then circled around my head 3 times. So there was my answer. Hummingbirds are so cool! Everyone on here has had some awesome experiences with hummingbirdS so I just had to share mine because it was one of well don’t even know how to put this experience in words kind of moments….. I am a paramedic and had just got done taken a patient home, has myself and my partner walked out to our ambulance we heard a humming noise, thinking it had of been a hornet or wasp that had gotten into the back of our ambulance (since this has happened many times) we were surprised when we saw a hummingbird of course I just had to take a picture ?however now came the challenge of getting this beautiful creature out of the back of this ambulance. As I opened the side down of the ambulance and stepped into the back the bird just sat on the handle that is on ceiling of the ambulance. I very calmly put my hand toward the hummingbird and she just sat there and then allowed me to pet her breast, trying to hold my excitement I then put my finger by the pole and she stepped onto it. I street walking to the back of the ambulance were the back doors layer opened and flew to the next hand rail. My partner then took my phone to take a picture as I placed my finger next to the hummingbird again and again she stepped onto my finger. Of course my partner took a couple of pictures. As I took a few more steps she flew to a back cabinet were again I was able to place my finger next to this beautiful bird and she stepped on it again. I then was able to get her to the back doors were she flew to a top branch of a near by tree. As I told my mother of this amazing in counter she told me that hummingbird must be my totem and proceeded to tell me about it. All I know is that I feel blessed to have this amazing experience in my life and will make the most of it ? Hi Mike, Im not sure that you will even get this note- but just in case you do… I wanted to respond to your message. The hummingbird (as with all creatures) is a messenger. Certainly your mother was correct in sharing that hummingbird is/was a messenger at the time (and still could be). We have many messengers coming in and out of our lives, all we need do is be present and see the creatures (including humans! trying to communicate with us. What is most important here, when I read your post is what hummingbird saw/sees in you. You are a gentle sentient being, just as hummingbird is. It was/is able to communicate with you because of your heart, the vibrations that you give off. You are in a helping profession Mike -there is no coincidence that this is the case. Hummingbird is showing you this and encouraging you to explore your true self. (so that is to say… what are you? why are you here? ) When you do ponder this, you will see hummingbird in a different way (but with the same heart), and other aspects of Creation will jump to life as you have never noticed before. This is called the awakening process. My dear friend, namaskar (the divine in me acknowledges and gives respect to the divine in you). I would lay in bed with my wife at night watching TV and it would sound like a Hummingbird would fly right behind my head. It would fly from my right to my left towards my wife. This happened several times. Each time I would turn my head around expecting to see a hummingbird…but never did. After several times I asked my wife “did you hear that?” She replied “no, hear what?” This went on for about 3 weeks and stopped. Then suddenly she became sick with pneumonia and ended up passing away. So my question is this: was the hummingbird a premonition of her death ? Also her dad who passed away years ago always liked hummingbirds. So could that have been him coming back for his daughter knowing that she was about to die? That is an AMAZING story!! Ten years ago I was getting ready to end my life. It felt like nothing I did ever made me happy or worked out for me. I had just lost three good friends, the love of my life, My therapist moved away, and I was no longer excited about my work and on top of all that I suffered from life long debilitating depression. My childhood it been very challenging, to say the least, and it left me with a lot of scars that made it impossible for me to live a normal life. I tried and tried to be like everyone else, to fall in love to have a lasting relationship, to be intimate with someone, but I felt like I was just too screwed up and I needed to start over fresh. So I was sitting in my livingroom telling one of my last friends that I really meant to do it and just then a humming bird flew into the house, circled over our heads and flew out again. It did this over and over and over. At least were times it might’ve been eight. I knew it was a message but I didn’t know what. “Be joyful” didn’t seem to fit. But about 8 years later I figured it out by watching a youtube video where this guy was planning to kill himself and the night before he intended to do it, he had a dream that he died and ended up talking to Jesus. In the dream he told Jesus that as much as he wanted to quit drugs and alcohol for the sake of his kids and his wife, he couldn’t seem to give it up and he felt like he was ruining their lives. He told Jesus to please not send them back there because he was only going to screw up his children and he didn’t want to do that. He said he talk to Jesus for a long time and Jesus told him, “You do have a lot to deal with and we know that you are giving it your all. We’re going to take some of this off your plate” and when he woke up from that dream he knew he was no longer a drug addict. He knew his craving was gone, it had been lifted from him, and in fact he never went back to drugs. In watching that video it felt to me like that’s what the hummingbird was sent to tell me. I felt like God or Jesus was looking down and listening to me tell my friend I couldn’t bear this life anymore and they just recognized that with all I had to deal with in life, it was just too much for me, and the message they sent me was, “we are aware of your how much baggage you are carrying and we’re going to lift some of this from you, because we don’t think you can do what you came to do on earth with all of this thrown on you. “. The reason I think that is because that day and in the days following my depression slowly began to lift and I have not been depressed in 10 years. I still have plenty of issues, life is far from perfect, but I can bear it. At that time I also decided to stop focusing on myself and my own life and to start focusing on being of service to humanity since I was already here. That may be the reason my depression has gone away. Nevertheless, I know that hummingbird brought me a message from above that I was not alone and that they were taking seriously what I was going through. I felt like a decision was made for them to step in and heal me of something crippling. Without that healing I do not believe I would be good to anyone in this world and it feels like they knew I was trying my best. Your story inspired me. I had a rough upbringing, but was naive to it until I was a young adult. Thats when depression started lingering in my life. I have been going through a back and forth custody battle while working a high stress job for about a year and a half. I had court yesterday. Two days prior I remember thinking that I actually could accept the fact that I don’t want to live life anymore. Of all of the years I battled depression on and off I NEVER entertained that idea for the sake of my children. But there I was, calmly coming to terms with the idea. I went outside to smoke a cigarette and this hummingbird comes flying up to me and I back up. It lingered and watched me, so I sat down. It flew back and forth about 3 times. It was like it kept changing it’s mind on whether or not it wanted to leave. I walked back into my house thinking for a few minutes about how strangely the bird acted. Well the depressing thoughts went away and I got consumed with all the fast paced world noise again. So now it’s the day after court and I’m home thinking about this hummingbird again. So I read about hummingbird visits and their meaning. When I read your story I am balling halfway through because I had forgotten about the thoughts that were running through my head. That hummingbird came to me just as your came to you. I just quit my harmful job and have finally gotten on my feet a little bit. I feel like the bird came to tell me to let go, enjoy life again, and start being the person I was wanting to be. Hi Kathy, I came to this site because I had a hummingbird come up to me over the past few days, within 4 inches of my face, and just levitate and look into my soul, basically for a few minutes each time and I wanted to know what that meant. I scan down and start reading your story and then BAM it hits me! I too had a similar conversation with Spirit, just like you did! I was at work and it was a stressful, competitive and hostile environment. I was a top salesman at a law firm during the height of the great recession. The job paid for my living expenses but I never could get used to the negativity that came with the job. Those were the most reassuring words that I had ever had spoken to me. Within a week, I had decided that I was no longer going to walk on eggshells in order to keep that crappy job. Because of that, I was “laid off” for inadvertently ruffling feathers. It was so relieving when I got handed my final checks that day. I got on unemployment and got by for a while and then things just sort of fell into place. I haven’t worked a legit full or part-time job since. My wife and I reunited and inherited her families business by default. We have a crew that takes care or the work for us and I do odd jobs but most of the time I’m at home playing Mr. Mom to my kids and taking care of the house. I get to garden as much as I like and its been a very supportive and peaceful existence. There have been some ups and downs but I’ve recently begun to live life in the way it was intended to be lived, “Happily”. I look for lots of little things that I can be grateful for and then start appreciating them as I recognize them. I’ve decided to try to live my life in the happiest and most joyful way as possible and it’s having a very pleasant impact on my relationships and its spread out into other areas of my life with extended family and even the people that I encounter in public. Its enriched my life experience and I’m very grateful and appreciative of it. So thank you for sharing your story. It’s a wonderful story and I really enjoyed connecting with you and I feel that because of our shared experience, we are kindred spirits! Two days ago I was at the county clerks office to sign up my Globalshift trademark for my business name and as I was entering the building a hummingbird seemed to fly or fall to the ground and laid on its back for a few seconds, as I walked up to it and was just a few inches from touching it, it flipped around and flew off. ? Today I was in my pea patch (“Grandma’s Herb Garden”), where I had just transplanted raspberry plants. I stopped for a bit, stood up, hands out and was doing REIKI so to speak on the newly transplanted raspberries – sending healing and love to the raspberries, then to the rest of the garden, then to the whole pea patch including the the birds, the bees etc. Then I heard a loud buzzing noise, and I was wondering if one of the bees was coming near, and then this very loud buzzing (very loud BIG buzzing) got so close it was right behind my head (actually touched my head or was it just the wind from the wings) and then flew off, I opened my eyes and saw a hummingbird fly away. . . It was totally awesome !! In my dream there was a bright yellow hummingbird. This hummingbird had babies that needed to be fed so me and a bunch of others tried helping the mommy humingbird find food. While we were looking, the hummingbird escaped the cage we had it in. After chasing it I quickly caught it, and cheers erupted for me, it wasnt but a few seconds later that I discovered that no one noticed I had caught it and they were cheering for a football game that happened to be on. While I was holding the hummingbird it was flapping against my hands so hard that yellow feathers were flittering off. Eventually I got it back to its babies after we fed it but we never found enough food for all of the babies. If you have any idea on what that means please let me know. When my buddy passed away a few years ago it really destroyed me. Every now and then when I’m having a bad day. This hummingbird shows up, to remind me everything is going to be ok. I was doing a delivery one day for work, and Wish You Were Here by Pink Floyd came on the radio. I was pretty shook up thinking about the good times. One I got out of my van there was the hummingbird hovering above my van. He stared at me for a few minutes, gave me a look and them flew away. It was pretty amazing, and then at my office once, 30 miles away the same thing. I was bummed about about my life. I got out of my car and there it was the hummingbird. Just to remind me that it’s ok. I see it as my guardian angel looking over me. I found a hummingbird in my garage this morning sitting on the ground quite still. I have no idea how it got in. I held him in my hand to warm him, tried giving him hummingbird food, and fell in love with him every second I held him. When I sat him down he would fidget and seemed upset, so I just held him for one amazing hour. He chirped once, seemed alert at times, and I called a vet hoping this meant he would be ok. He died in my hand. I cried like I haven’t in ages and have been heartbroken since. Later in the day, a coyote ran across my path on the road. I live near a nature reserve but this is alot for a suburban area, and it seems like an omen. 😕 I live in the city of Philadelphia I have never seen a hummingbird in my life for real , just recently I have seen it on my porch I thought it was weird I don t know the meaning of this and count it as a blessing , however, is this a spirit trying to tell me something ? does anyone have an answer ? I was sitting one the porch one day and thinking about my life and going through a diffacult time. And all of a suddon a hummingbird flu right up in my face I mean about 4 to 6 inches away from it and my first thought was I allmost flinched as thinking is he going to take my eye out with that long beak but I stopped and didn’t move as if something stoped me and assured me I was safe it was amazing beautiful the hummingbird was there WHAT felt like a good min but it was defanitly 30 seconds I could hear his wings so loud and soothing at the same time I don’t know what it ment but I FELT better as I ran inside to tell my girlfriend what just happened to me and she said it was probably my mother telling me she was proud of me and keep on going.well it’s about 3 months ago that happened and yesterday I was sitting in my garage and all of a suddon I hear a tapping on the window I look over and there was a little yellow bird sitting on the sill looking at me an HE kept tapping like crazy and jumping up and down flapping against the window for like 2 min I finished my cigerette and went inside and told my girlfriend she came to see it was gone 3 hours later I’m having another cig and it returns DOING the same thing so I got up walk over to the window and open it IT jumped back into the Bush ONLY a foot away and sat there looking at me I don’t want to let it in might it get hurt trying to fly out another window so I closed it but I didn’t recognize what kind IT was so. I looked it up and turns out it was a female warbler and very rare to find and see . Well my life has not got any easier since the hummingbird kneading and it has gotten great at the same time I’m in big trouble for something I didn’t do and I just had a beautiful baby boy so I love mg son and thank God for him but am afraid I might get put in Jain for a while for the trouble and am looking for answers what message is this all bringing me I’m new to the whole spirit animals THING and my girlfriend is just LOVING that I am opened up in my head to consider such a thing she is all about stuff like this nature spiritual things in the universe and all that anyone know what this all means or if one of these are my spirit bird or how do I find my spirit animal I mean the hummingbird is ME to a tee and the warbler thing is crazy ?? Answers ANYONE??? I found a dead humming bird at work inside , what does this mean? I knew what this meant as soon as I read it. What’s interesting is that the numbers in the date/time of posting all synchronize with the message : The numbers add up to 6-11-8- 11-22. They then total to 22. Both 11 and 22 are master numbers and relate to creating your reality by connecting to your Soul (see Joanne Sacred Scribes for more on the numbers).There is also an 8 in there which is the Hummingbird number as their wings fly in the pattern of figure 8 which represents infinity. The bird symbolizes that you should not under any circumstances let your dreams die. Follow your heart. You are here for a unique purpose. After my mom transitioned, I use to go into her bedroom & look out the window as she did regularly, On one occasion a hyminbird appeared from know were and it was beautiful, It seemed to speak to my soul, It flap wings and look at me for about two minutes and disappeared, I will never forget that day, and I have been secretly wishing it happens again. I was being told that when I would have great change for myself- something would appear and transform me. I was at a school with someone being and I was fearful to meet with a woman that was heavy set and known for being mean. I was preparing myself with the person I was walking with as I turned the corner and ran into her. 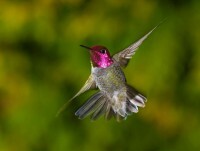 Instead of fear taking over- a green backed hummingbird stopped time. (The movie sound of time warping and the sensation of pure joy and happiness consumed me as it’s wings slowly fluttered and my sight was fixated on it. It turned it’s side and the honeycomb-like green speckles on it’s back glistened in the sun light. I was consumed in love and time went back to normal.) I didn’t hesitate, I greeted her with the largest smile and love in my heart genuinely happy to meeting with her. She was so happy to see me too. The hummingbird was beautiful, and large while it stopped time to make eye contact with me. When it did, its eyes locked with mine felt like it instantly transferred the desire to be happy, joyous & full of love. When I heard that sound that stopped time makes, like the ones in movies, I focused on the wings and the honeycomb shape in it’s green back and as it glistened it made me feel overwhelmed with love and time was back to normal as I floated out of that trance and into greeting this heavy set woman people feared. My partner and I were picked up by the rest of the crew also on the same journey and I was able to say that I saw it. I was passionate about what I saw and the support of those 5 in the car helped me feel alive. The heavy set woman could be closely described as the boss from wanted. I just woke up from this dream and have only this last year started to learn about spirit animals. I’ve always been surrounded by hummingbirds my whole life. I haven’t seen one in 3 months until my dream. I’ve been experiencing so much change in my life that sometimes I feel anxiety is taking over- only BC I feel there’s a message I have to uncover and pursue. I’ve recently changed careers working for bad business leaders to make a difference using my skills for good and focusing on education, specifically those with special needs. I’ve opened up The School of Meaning all from listening to what’s around me, the needs of the people I’m meant to reach. This probably sounds totally nuts- but I’m floored at how vivid this dream was. Any insight would be well received. That just happened to me!!! I feel so blessed Yes, I asked for a signal, because I so needed one. I see Ravens/Crows, and Turkey Vultures on a daily basis. As well as Dragon flies that zoom right at my head than turn and disappear. I know these are Huge signs from Spirit. It’s like I’m being spoken to. But, nothing ever follows. I’m sure a lot of it has to with a particular man that I know. He’s going thru some major life issues. So I gather these signs as well as others are telling me to hang on, cause changes are coming.? Hello Dianne: The signs are for you and no one else. Own them. Pay attention to the quotation boxes at the top of each animals page – the messages will be specific to you. Pay attention to the messages even if they don’t seem relevant to you. I assure you that they are and that you must incorporate the wisdom into yourself. Hi Marj: Frog and pay close attention to the quotation box for your message. Hi! About a month ago, I felt compelled to look out the window, so I did and saw a bird, I think it was a hummingbird, flying in the infinity pattern exactly in the middle of my huge backyard! It did this consecutively 2 or 3 times, then flew away. What exactly does this mean? Then the other night, I heard 2 or 3 Owls having a conversation. Is there a message as to why I heard the Owl conversation? The Owl is definitely my totem. See them all the time! I know they represent major transformation for me, which I have been in major transformation on all levels, but was wondering if any other message in there I may not be seeing right now in addition to the Hummingbird Infinity pattern message ? Hi Marj: Pay close attention to the Quotation box when you come back to this page – it will give you a message specific to you with regards to your Hummingbird. I just had a dream of me running from fear and as I turned the corner a humming bird came out from behind a tree. It flew towards me and poked me with its beak on the right side of my neck. What does this mean?